Bluefrog are delighted to have won first place for the most innovative use of digital media at the recent Third Sector Excellence Awards event in London. 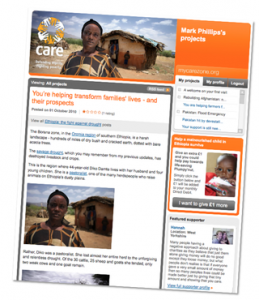 Working with Care International UK, Bluefrog developed an online donor focussed site to stem attrition and build donor engagement. The site www.mycarezone.org shows donors what their gifts have actually made possible. Through regular updates, donors get to see ‘their’ projects unfold and are encouraged to share why they support Care International. They can flag up what work they want to find out more about and can easily change their level of giving. The result – a massive 50% fall in cancellations from existing donors. “Engagement is up and attrition is down. We are now offering USPACE to all supporters and plan to expand its use to reactivation of lapsed donors. Supporters feedback shows they really appreciate seeing how they actually make a difference. mycarezone.org was built using Uspace, Bluefrog’s online attrition busting web application. Uspace in now being used by a growing number of UK and international charities to build donor engagement. To read more about Uspace and how it works click here. You can also read about the award entry here. If you’d like to see exactly how Uspace works and how it could help your charity reduce lapse rates and increase income, email moc.nodnolgorfeulbnull@kram.